In recent years, efforts to detect and treat prostate cancer have increased dramatically throughout the United States, resulting in approximately a threefold increase in the reported incidence of the disease and a dramatic rise in the number of radical prostatectomies and irradiation therapy treatments (20,24).The incidence of prostate cancer has begun to decline (a probable result of saturation by prostate cancer screening), and age-adjusted mortality from prostate cancer (as well as other malignancies) has also declined by approx 5% from 1990 to 1995 (20,39). Unfortunately, the mortality rate remains exceedingly high—a somewhat surprising condition in light of the increased utilization of potentially curative treatment modalities over the last decade. 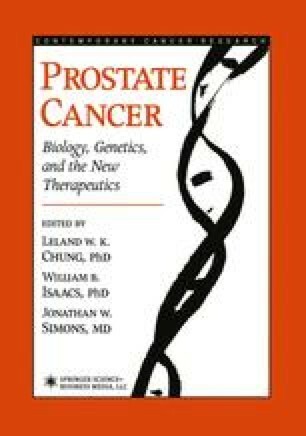 One possible explanation for the low impact of prostate cancer therapy thus far is that occult metastases were present at the time of treatment. The treatments currently used for presumably localized disease are indeed exclusively local treatments that are designed to ablate the primary tumor either surgically or through radiation. Metastatic disease at the time of treatment would therefore continue to progress. The reported failure rate, within 5 yr as indicated by rising prostate specific antigen levels for patients undergoing radical prostatectomy, ranges from 20% (30) to 57% (55), indicating the presence of either local tumor recurrence and/or occult metastasis at the time of treatment. The assessment of prostate cancer in regard to stage of disease is complicated by the lack of reliable, specific tests that differentiate localized disease from early metastatic disease, and the highly complex presentation of the local tumor.